Manchester is to host a free two-day electric vehicle event aimed at stakeholders, SMEs and drivers, run by charging solutions supplier Franklin Energy and parking operator Q-Park. 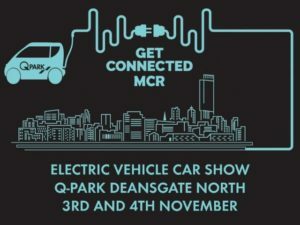 Get Connected MCR will take place the Deansgate North Q-Park, near to the Arndale Center, on the 3rd and 4th November, with Tesla, BMW, Renault, Nissan, Uber and Enterprise confirmed as exhibitors. Day one will be aimed at industry stakeholders, SMEs and the public sector and will be held between 2.30pm and 6pm. The Saturday event will be open between 10am and 4pm, and is aimed at consumers. Franklin Energy and Q-Park have been working together to establish a network of charging points at sites across the North of England – the two companies recently completed a network of 22kW units spanning the Northern Powerhouse.